The spine (vertebral column) is in adults of 24 vertebrae (7 cervical, 12 thoracic, 5 lumbar), sacrum and coccyx. The sacrum consists of 5 accrete sacral vertebrae, and the coccyx of 4-5 PC (Fig. 1). Each free vertebrae in the spine consists of more massive part, located anteriorly,- the vertebral body and arcs. When imposing one vertebra to another body and arc vertebrae form the spinal canal, which is the spinal cord. 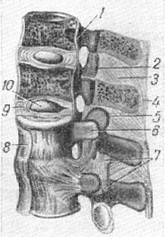 Clippings on the arcs of the vertebrae form of intervertebral hole leading into the spinal canal. From Doug vertebrae in side there are the pair of lateral shoots upwards and downwards two pairs of articular processes, and from the middle of one spinous process (Fig. 2). Fig. 2. Eighth thoracic vertebra (left to right): 1 - spinous process; 2 - transverse process; 3 - rib facet transverse process; 4 - top articular process: 5 - the top edge of the pit; 6 - the body of the vertebra; 7 - the lower edge of the pit; 8 - the lower spinal tenderloin; 9 - bottom articular process. Fig. 3. 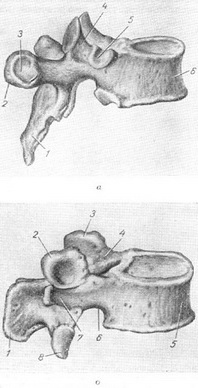 The first cervical vertebra (top): 1 - rear tubercle; 2 - side weight; 3 - transverse process; 4 - top joint hole; 5 - front tubercle. The value of the vertebrae increases from top to bottom to the top of the sacral, and then decreases sharply. The cervical vertebrae there are openings in the transverse processes, through which the vertebral artery and vein. Body VI cervical vertebra has a front bump, developed stronger than the other vertebrae (the mound of Sassenach). This mound is convenient to press carotid artery at a bleeding from her. Spinous process of VII cervical vertebra long, easily palpated in humans and is one of the identification of points at the expense of the vertebrae. I have cervical vertebra - Atlanta - no body (Fig. 3). He has front and rear arc with articular sites top and bottom for articulation with the occipital bone and II of the cervical vertebra. II cervical vertebra - axis, or epistrophy,- is a process directed upwards (tooth), which is articulated with the first cervical vertebra. The bodies of the vertebrae (except I and II of the neck) are connected to each other through the intervertebral discs of cartilage and ligaments. Articular process form the intervertebral joints. The spine has a physiological (normal) curvature in the neck - bend forward (lordosis), breast - backwards (kyphosis), in the lumbar - again to the front. In the spine possible bending and straightening, bending and rotation. Most mobile cervical and verhnebakansky departments. The spine (columna vertebralis - spine) - the main part of the skeleton of the body, is a case for the spinal cord, the body of a support and movement. Embryology. In the embryonic development of the spine there are three stages: webbed, cartilage and bone. The stages of change happens gradually, in the form of partial substitution and displacement of one tissue to another. Early in fetal development around formed chord kepleyts mesenchymal cells, which serve as a rudiment of the bodies of the vertebrae and ligaments of the spine. The 5-week embryo cells surrounding the chord are separated messagestream arteries into segments - sclerotomy (Fig. 1, a). Accordingly, the latter are myotomy, of whom develop muscles. Each sclerotome is divided into two parts: the caudal, more dense, and cranial, less dense. Further, the cells of sclerotome, located near the arteries, are factored into the vertebra, and from the head section of the caudal half of sclerotome located away from messageentry arteries, develops intervertebral disk (Fig. 1, b). Myotome during embryogenesis is fixed to the two adjacent vertebrae, which provides the action of the muscles of the spine (Fig. 1). Fig. 1. The scheme of development of spine Kay and Comper; and each segment is divided messecentret artery on two divisions; b - areas adjacent to the arteries, are factored into the vertebra; head of Department dense caudal half away from messecentret artery, differentiated in the intervertebral disc, in - predgradie body vertebrae: 1 - the ectoderm, 2 - dermatome; 3 - myotome; 4-spinal nerve; 5 - chord; - primary vertebra, 7 - aorta; 8 - lead half sclerotome, 9 - caudal half of sclerotome; 10 - messageentry artery; 11 - area from which develops intervertebral disk; 12 - zone, differentiate into the vertebra; 13 - body prekrasnogo vertebra; 14 - extension chord in the intervertebral area. The formation of an intervertebral disc begins with a dorsal Department, the most remote from the power source - aorta. On the 10th week of embryonic development of the intervertebral disc is separated from the cartilage vertebra fibrous cartilage shell. By this time on the periphery of intervertebral disk begin to form the elements of the fibrous ring. The embryo 4 months fibrous ring becomes more pronounced and binds the adjacent vertebrae. Further there is a relative decrease the thickness of the intervertebral disk, fibrous ring expanding in Central direction, but by the time of birth of the intervertebral disc is not formed yet. Fig. 2. The nucleus of ossification and the vessels of the vertebra of the fruit of 3.5 months. (Fig. with enlightened drug; X15). Fig. 3. II lumbar vertebra 6-month fetus; visible vessels of ossification nuclei (Fig. with enlightened drug; h). In the 10th week, the vertebrae become fully cartilage. The first point of ossification in the vertebrae arise for 8-10 weeks of embryonic development. At the beginning of the 4th month of fetal life, they merge into one core in the body of the vertebra and in two cores in arms. The process of ossification of the vertebrae depends on their blood supply. The vessels are always "go ahead" of ossification (Fig. 2). Having two cores of ossification in the body of the vertebra may lead to the anomaly of development - sagittal the crack of the vertebral body (rachischisis, see below), which is accompanied by other abnormal formation of the spine with the formation of bending and strain it. Further changes of ossification nuclei are reduced to increase in size and 6-month embryo, the kernel directly adjacent to the rear surface of the body. Height kernel slightly less than the height of the vertebral body. 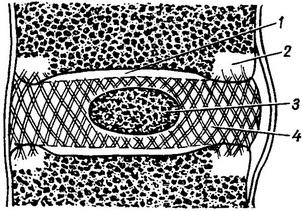 Kernel vertebra built of radial bone columns running from vascular gate (Fig. 3). In the following months embryonic development is the increase of the vertebra and a gradual replacement of the cartilage of the bone. At the same time to the birth of nuclear fusion of ossification is happening yet. The newborn clearly visible lateral shoots side of ossification nuclei, however, transverse process of vertebra remains basically the cartilage. Cartilage remain, and other processes. During the prenatal life of various spine grow in length with different energy. After the birth of the most rapidly growing lumbar spine P.
Anatomy. The spine (Fig. 4) consists of 33-34 vertebrae, of which available 24 (7 cervical, thoracic and 5 lumbar); the rest (fused) form two dice - sacrum (5 vertebrae) and the coccyx (4-5 vertebrae). Each vertebra front has a body (corpus vertebrae), which goes backwards shackle (arcus vertebrae)that carries a number of processes (Fig. 5). Shackle together with the rear surface of the vertebral body limits the vertebral hole (foramen vertebrale). Vertebrates holes all vertebrae form the spinal canal (canalis vertebralis), in which lies the spinal cord with the meninges and blood vessels. In the shackle distinguish front thickened Department - legs (pediculi arcus vertebrae) and the plate (lamina arcus vertebrae). From bow in hand, depart transverse processes (processus transversi), backwards - spinous process (processus spinosus), the up-and down - articular process (processus articulares sup. et inf.). Fig. 5. Typical of the thoracic and lumbar vertebrae; and VIII of the thoracic vertebra: 1 - processus spinosus; 2 - proc. transversus; 3 - fovea costalis transversalis; 4 - proc. articularis sup. ; 5 - fovea costalis sup. ; 6 - corpus vertebrae; 6 - III lumbar vertebra: 1 - proc. spinosus; 2 and 3 - proc. articularis sup. ; 4 - incisure vertebralis sup. ; 5 - corpus vertebrae; 6 - incisura vertebralis inf. ; 7 - proc. transversus; 8 - proc. articularis inf. Fig. 6. I cervical vertebra (top): 1 - tuberculum post. ; 2 - massa lat. ; 3 - proc. transversus; 4 - fovea articularis sup. ; 5 - tuberculum ant. Fig. 6A. II cervical vertebra (And above B - side): 1 and 8 proc. spinosus; 2 - proc. transversus, 3 - facies articularis sup. ; 4 - dens; 5 = corpus vertebrae; 6 - foramen transversarium, 7 - proc. articularis inf. Fig. 4. 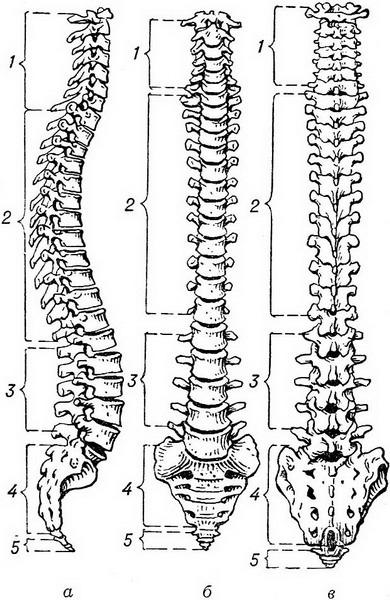 The spine: A - side view; B - front view; In - back view. 1 - the cervical spine; 2 - thoracic Department; 3 - the lumbar spine; 4 - sacral part; I sacrococcygeal Department. From the General type of the structure of the vertebrae are distinguished, I and II of the cervical vertebrae. I vertebra - Atlas (atlas) is a ring consisting of two arcs, interconnected side thickened parts (Fig. 6). II cervical vertebra - epistrophy, or axis (axis), on the upper surface of the body has odontoid process (dens), which articulates with the front arch I cervical vertebra (Fig. 6A). The bodies of the vertebrae are connected with the sacrum by intervertebral disks (disci intervertebrales). The latter consists of the fibrous ring (anulus fibrosus) and gelatin core (nucleus pulposus), representing a closed cavity with gelatinous, vitreous content. Fig. 7. 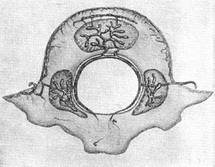 Intervertebral disk (scheme): 1 - closing cartilaginous plate; 2 - Apophis vertebral body; 3 - gelatin the core; 4 - the fibrous ring. On the front and rear surfaces of the bodies of the vertebrae and disks are anterior and posterior longitudinal ligament (ligg. longitudinalia anterius et posterius). Anterior longitudinal ligament stretches from the occipital bone to rump, attaching itself to the vertebral bodies. This link has a large elastic force. Posterior longitudinal ligament also starts from the occipital bone, and comes to the sacral canal, but not attached to the vertebral bodies, and becomes firmly integrated into the disk, forming in these places extension (Fig. 8 and 9). Fig. 8. The ligaments and the joints of the thoracic spine: 1 and 5 - lig. costotransversarium post. ; 2 - lig. intercostale int. ; 3 - lig. tuberculi costae; 4 - lig. intertransversarium; 6 - capsula articularis; 7 and 8 - lig. supraspinale. Fig. 9. Lumbar spine: 1 - lig. longitud. post. ; 2 - lig. flavum; C - lig. interspinale; 4 - lig. supraspinale; 5 - proc. artic. sup. ; 6 - proc. transversus. 7 - lig. inter-transversarium; 8 - lig. longitud. ant. ; 9 - anulus tibrosus; 10 - nucl. pulposus. Arch vertebrae are joined together by means of yellow ligament (ligg. flava), spinous processes - mistissini ligaments (ligg. interspinalia), the transverse processes - Mezobereny ligaments (ligg. intertransversaria). Over the spinous processes along the entire length of the spine passes nedostacha ligament (lig. supraspinale), which in the cervical spine increases in the sagittal direction and is called the nuchal ligament (lig. nuchae). Articular process form the intervertebral joints (articulationes intervertebrales). In different parts of spine and joint processes have different shape and location. So, thoracic they are front. Articular surface of the upper processes directed to the back, bottom - front. Therefore, the gap between processes on a straight radiograph is not visible, but on the good side is revealed. Articular process lumbar vertebrae occupy a superior position, and therefore the gap between them on the straight line x-ray clearly visible. Fig. 10. 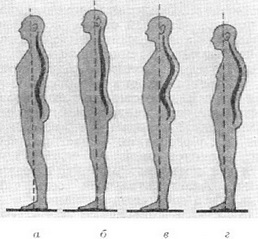 Types posture: a - normal posture; b - flat back; in - round or round-concave back; Mr. stooping back. In the process of development of the child's spine acquires several bends in the sagittal plane: in the cervical and lumbar regions, he bends forward - is formed of lords (see), in the chest and hips departments - back - formed kyphosis (see). These curves along with elastic properties of intervertebral disks cause shock-absorbing characteristics of the spine. Under the influence of a number of adverse conditions - the weakness of the muscular-ligamentous apparatus of the spine, static disorders (irregular posture of the child during school and home studies) - develops wrong (pathological) bearing (Fig. 10). The smoothing of curves P. develops flat back, while increasing their round or round-concave. The most complex character incorrect posture due to lateral curvature P. forming scoliotic posture. However, it should not be confused with scoliosis (see) - disease, which manifests itself lateral curvature P., but differs deformation of individual vertebrae and P. in General. The motion of the spine can occur around the three axes: control (flexion and extension), sagittal (tilt to the side) and vertical (circular motion). The most mobile of the cervical and lumbar departments P., less - upper and lower segments of thoracic and even less - middle segment. The degree and nature of mobility of the spine are associated with a number of conditions, in particular with the shape and position of articular processes, height of intervertebral disks, the presence of edges that limit the movement of the thorax P.
The blood supply P. is of major arteries passing either directly by the bodies of the vertebrae, or near them, and these vessels depart directly from the aorta or (for cervical P.) subclavian artery. Blood in the spinal comes under more pressure than what is due to high blood even small branches. Lumbar and intercostal arteries (AA. lumbales et intercostales) are on the front-side of the vertebral bodies in the transverse direction, and in the field of intervertebral holes from them depart back the branches supplying the dorsal Department vertebrae and soft tissues of the back. Rear branches lumbar and intercostal arteries give spinal artery (rami spinales), penetrating into the spinal canal. In the spinal canal main trunk spinal artery is divided into front (larger) and the back of the branch. The last is transversely to the posterolateral wall of the spinal canal and anastomosed with the corresponding artery opposite side. Front end branch spinal artery passes transversely to the front and on the back surface of the vertebral body anastomosed with the same branch of the opposite side. These branches are involved in education ANATOMICHESKOE network, located on the back surface of the vertebral bodies in the posterior longitudinal ligament. ANATOMICHESKOE network extends all along the spinal canal and has longitudinal and lateral branches. From her leave the arteries supplying the body of the vertebra, the spinal cord, and peripheral Department of intervertebral disk. Through the front and side surfaces of the vertebral bodies shall take a large number of branches, among which are marked 2-3 large branches that are included in the body near the midline. 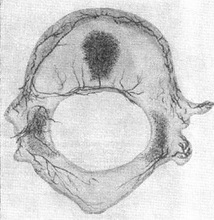 These branches anastomosis in the body of the vertebra with posterior branches. From the vertebral body in the intervertebral disk vessels, however. The venous system of the spine presents four venous plexuses: two external (plexus venosi vertebrales ехterni)located on the front surface of the vertebral bodies and behind the temples, and two internal (plexus venosi vertebrales interni). The largest plexus - front vnutripolostnoe - presents large vertical shafts, interconnected cross branches; it plexus is located on the rear surface of the vertebral bodies and fixed to the periosteum of the numerous bridges. Back vnutripolostnoe plexus has strong links with the walls of the spinal canal and so easily dismissed. All four venous plexus of the spine have numerous links, with the front of the external and internal plexus anastomosis through vv. 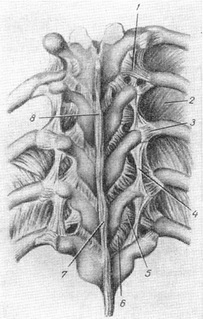 basivertebrales passing through the bodies of the vertebrae, and rear external and internal plexus related thin branches, provadiyska yellow ligament. The outflow of venous blood from the spine is made in the system of the upper and lower hollow vein vertebral, intercostal, lumbar and sacral veins. Each intervertebral Vienna, passing from the spinal canal through the appropriate intervertebral hole, well connected to the periosteum of bone edges of holes, so if the damage these veins are not zadayutsya. Venous plexus of the spine, making up a single whole, extend from the base of the skull (here they are related to occipital venous sinus) to the coccyx. This venous system, widely Anastasiya with paravertebral veins,is an important communication between the upper and lower hollow vein. As I believe, this collateral path is of great importance in maintaining the functional balance between the upper and lower hollow vein. The absence in the veins of the spine valves makes it possible to promote blood in any direction. This function of vertebrate veins, according to some authors, explains their role in the spread of infection and metastases in P.
Lymph flow in the cervical spine P. is in the direction of deep cervical lymph nodes; in Wernigerode - in nodes posterior mediastinum; in nizhnegorodsky - through intercostal lymph nodes in the thoracic duct. Of lumbar and sacral regions P. lymph going in the same lymph nodes. Postnatal development. In the postnatal development of the spine continued growth and ossification of the vertebrae, and differentiation of intervertebral disks. In the first year of life, the structure of the spongy bone of the vertebral body. According to most authors, siestas nuclei of ossification in the area at the base of the spinous process comes to three years, but in some cases this process is delayed up to 12-13 years, and sometimes do not completed, and thus there is spina bifida (see). It is often observed in the fifth lumbar and I sacral vertebrae. The frequency of the symptoms of spina bifida in these vertebrae encouraged to consider it here not as a malformation of the spine, but as an option. Fusion of nucleus of ossification of the vertebral body with nuclei of ossification of the arch in the lumbar spine is aged 4-8 years. Thoracic layer of cartilage between them is kept up to 12 years. 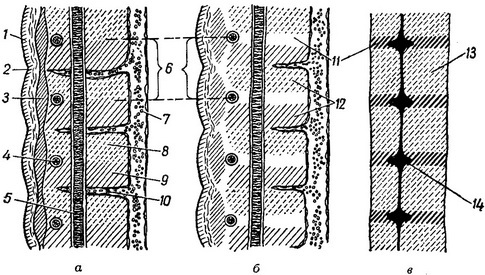 During postnatal development of intervertebral disk gradual seal gelatin kernel and differentiation of fibrous structures of the fibrous ring. Gelatin the core of young actors contains mostly rich in water main amorphous substance, located among the collagen fibers. Saturation gelatin kernel water determines its physical properties as static shock absorber. load, the distribution of mechanical power over the entire surface of the vertebral body (Fig. 11). With age due to the decrease of water content turgor of the nucleus decreases, it gradually hardens and loses its elasticity. In people over 50 years gelatin the core reminds cheesy mass. Fibrous ring during postnatal development also undergoes a number of changes. Already in 2 years of age marked fibration into front and rear sections of the disc with interlocking beams With age interweaving of fibers is much more complicated, they swell. This is clearly revealed in the second five years of life. By the end of the second decade of the swelling becomes large, and fiber differ not very clear. Intervertebral disk in General finishes its development to 22-24 years.